Join us Sunday, May 5th @ 12:30pm to begin our spring planting! 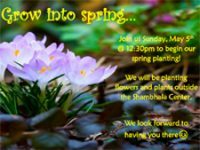 We will be planting flowers and plants outside the Shambhala Center. We look forward to having you there.